I don’t really feel like I need to make any resolutions this year, because I think I already got my life kind of in order. I eat clean (most of the time). Diet, Check! I started working out with a trainer about 3 months ago, and have been seeing great results. Fitness, Check! My job is going well. Work, Check! I love writing this blog. Hobby, Check! Andrew is snoring away upstairs right now. Exciting relationship, Check! Audrey is snoring beside me right now. Dog, Check! What else do I need to check off? 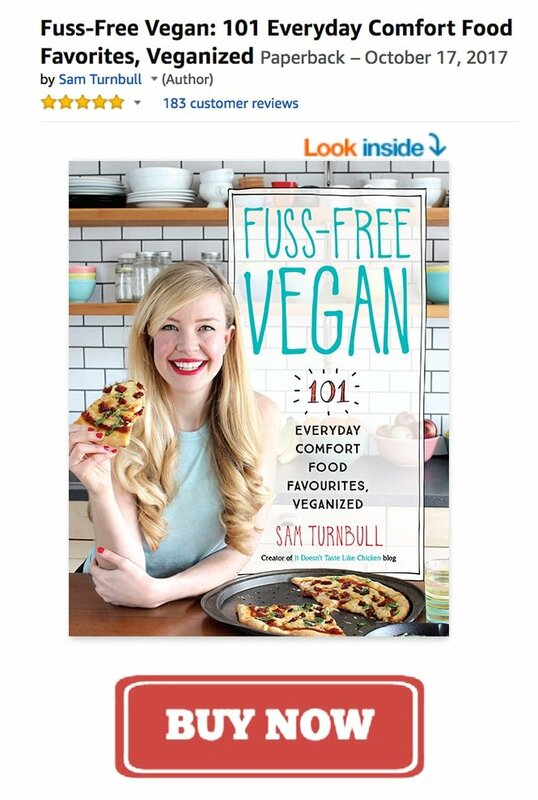 Seems like I just need a few delicious recipes to get the year started and I am all in order… (ask me again if I feel all in order in a month). Some of you may be trying to clean up the diet, or perhaps you just like salad. There is just something about winter… perhaps the freezing temperatures, sheets of ice, and 20 layers of clothing…that just doesn’t say, “feed me raw cold vegetables, they’re totally warm and comforting…sorta…ok, not really”. So, I love trying to find ways to get more raw veggies in the winter, without fighting with the season. Sometimes salad just doesn’t seem wintery, but not all salads have to be green. Using root veggies always seems fitting, so this salad (although only half raw) has a real seasonal feel about it. 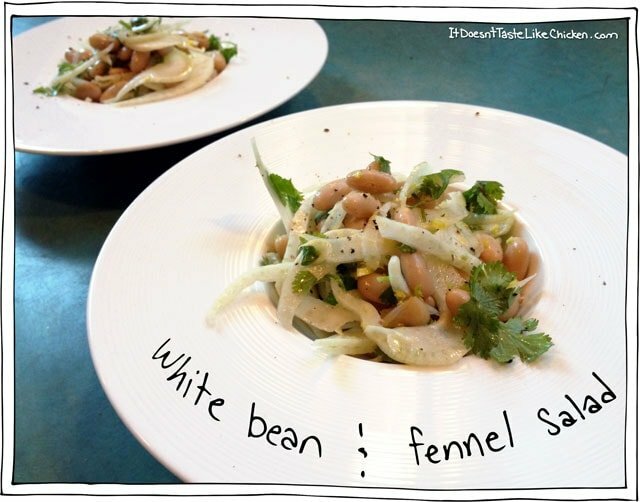 I love the liquorish-y fennel combined with the bright lemon vinaigrette, and the white beans add enough oomph that this could even be a light meal. To make the vinaigrette, add all of the ingredients into a small bowl then whisk with a fork. Or you could add all of the ingredients into a jar, and then shake. Shake weight anyone? Taste, and adjust seasoning as nessecary. I always find a general rule of thumb with salad dressings is that it should taste a little too sour. 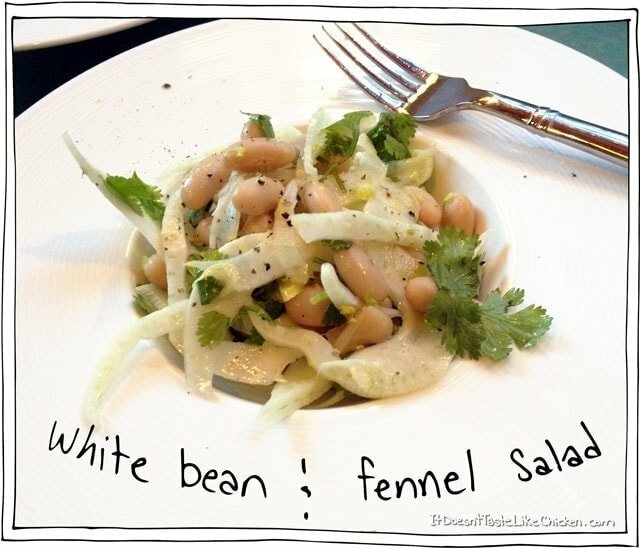 The sweetness of the vegetables will dilute the sourness making the end result perfect! If you are new to a fennel bulb, this odd white and green thing is it. Clean up the fennel bulb by cutting off the bottom, and removing any outer layers that look gross. Using a mandoline, or a knife, finely slice the fennel bulb. 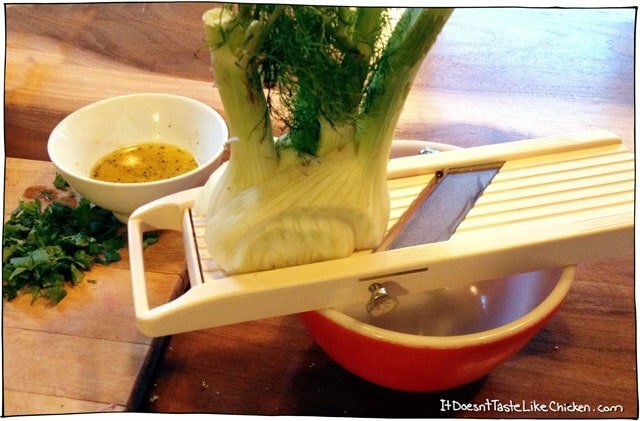 I love this mandoline! Makes the job so easy, but be extremely careful! Mandolines are wicked sharp, and we don’t have go to the emergency room on our resolution list…at least not mine, because that would be a weird goal. The round part of the bulb is the only part you want to eat. 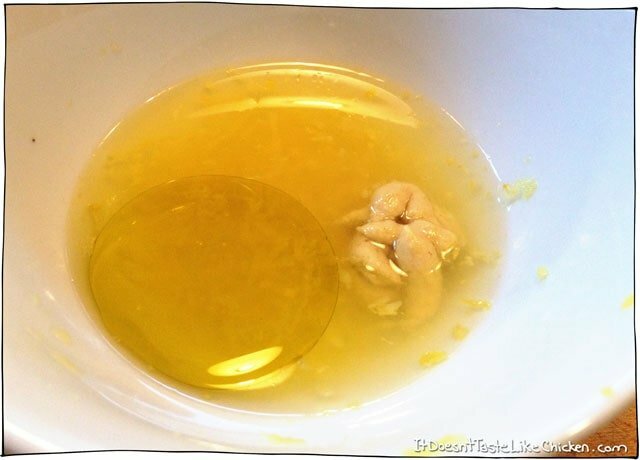 If you want, you can save the stems and any other leftover bits to make a stock with. Drain and rinse your can of beans, and roughly chop the cilantro. Toss all the ingredients together and dress. You may not need all the dressing so use to taste. Finish with a crack of pepper.